(Newser) – In an ABC interview certain to draw some angry tweets from President Trump, former FBI director James Comey slammed the president as "morally unfit" to lead. 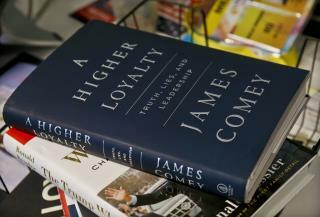 In the interview with George Stephanopoulos, which aired Sunday night, Comey reiterated much of what he says in upcoming memoir A Higher Loyalty, likening Trump to a Mob boss and his administration to a forest fire. He described Trump's obsession with a salacious Russia dossier—and said he wasn't sure if he believed Trump's insistence that none of it was true. "I honestly never thought these words would come out of my mouth, but I don't know whether the current president of the United States was with prostitutes peeing on each other in Moscow in 2013," Comey said. "It's possible, but I don't know." the little prick was involved with the Hillary and Clinton gang back in the 90s Why would I trust what he has to say. As expected, George Stepontopofus was short and weak. The Comey household : "Shattered" when Hillary Clinton was not ordained "1st woman President." Splattered all over Manhattan. Sheylooby. Comey, Hillary Clinton, and Cheryl Mills for Cell Block H.
Comey shouldn't go to prison.Comey should be given to Hillary. Never to be seen again. No one keed be lower then this pos. Comey's day is coming. Bent over and coming.